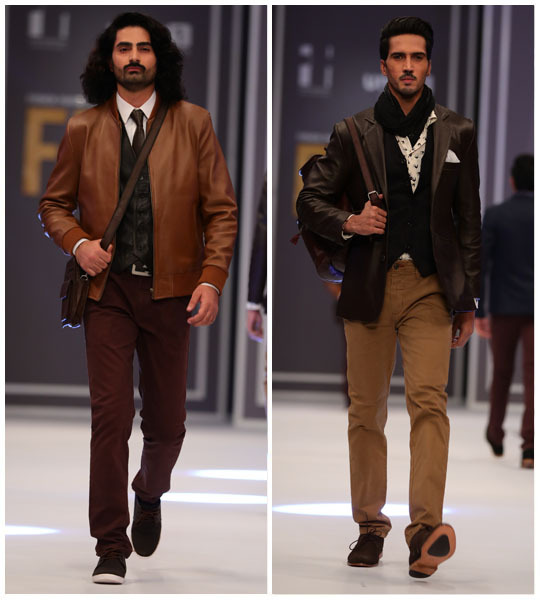 Amir Adnan opened day one with sleek and suave western wear! 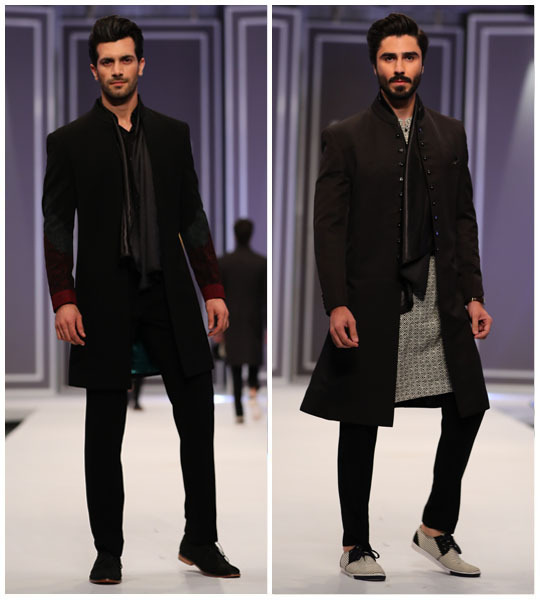 The range comprised of innovative cuts and simple silhouettes, boasting a clean design aesthetic. 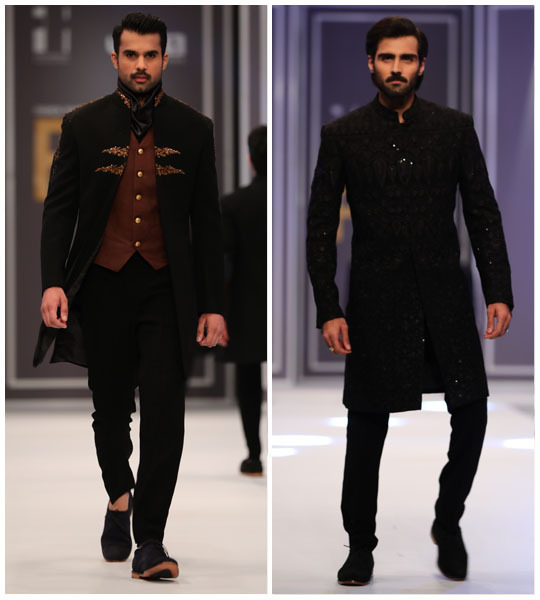 Tuxedos, jackets, ties and shirts in rich, regal hues emanated a classy and sophisticated appeal. 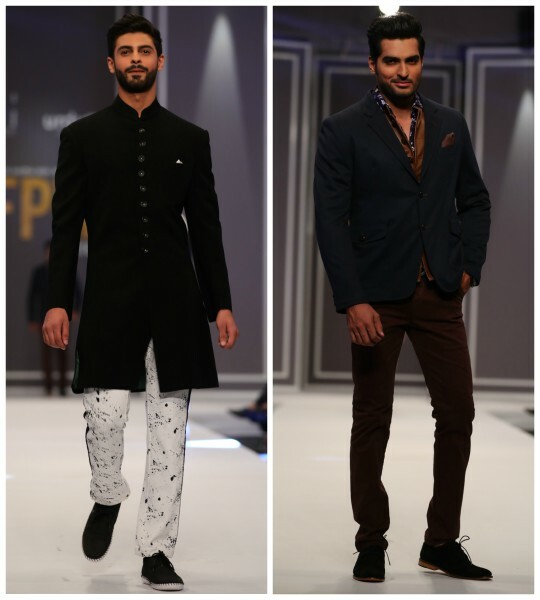 We loved how there were pops of print and embroideries, which added an edgy element to the exquisite and well tailored clothing. 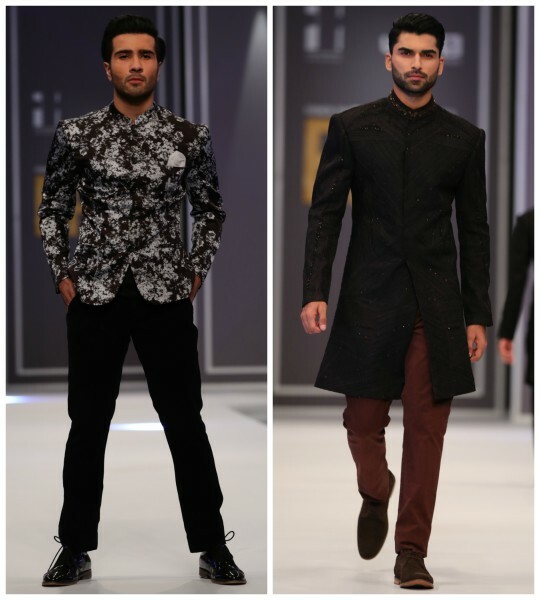 So boys, you now know which designer to go to for a smart and dashing look! 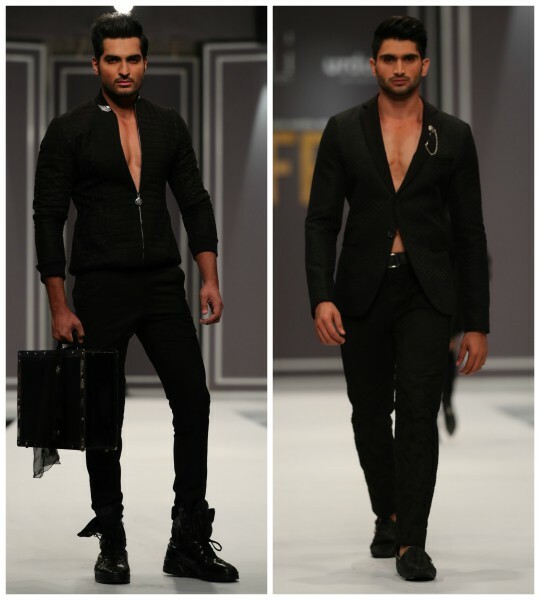 Amir Adnan always does it best! 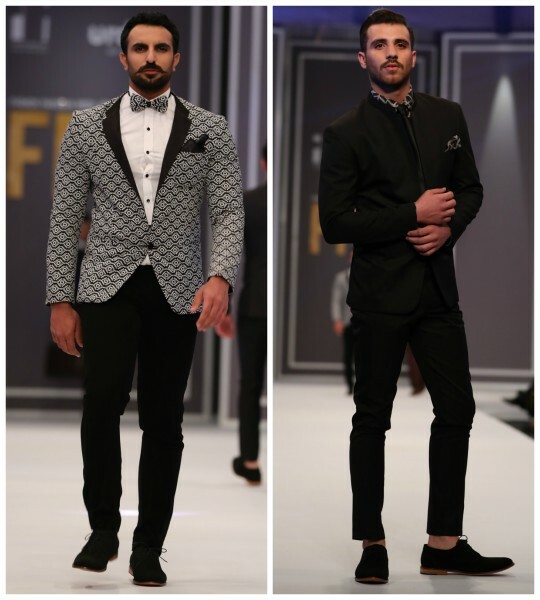 We were really looking forward to HSY’s ‘Onyx’ collection and were hugely impressed with what we saw! 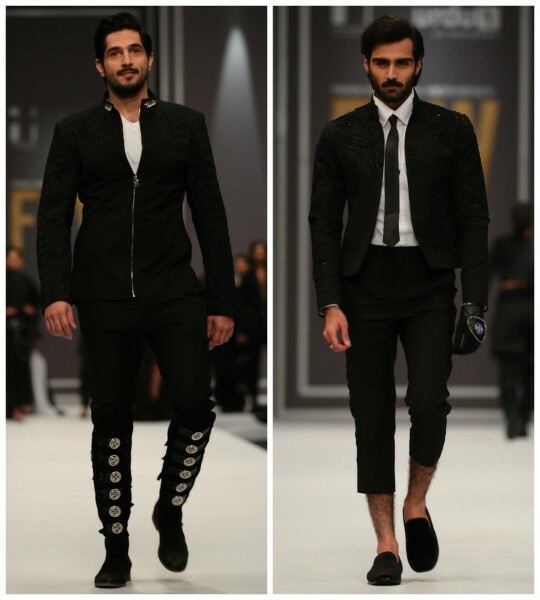 A range that focused mainly on the working woman, comprised of all blacks with pops of white for a monochrome touch. 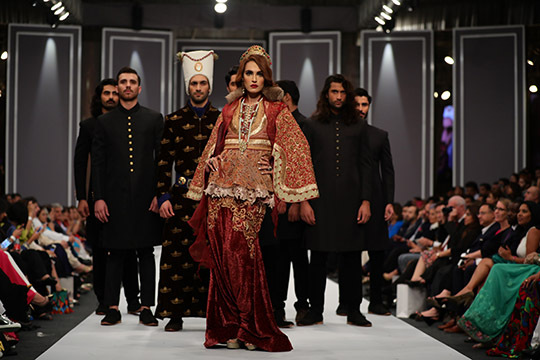 There was a mix of suits, flares, jackets, dresses and capes in interesting silhouettes with edgy and feminine elements including chains, belts, layering techniques and fun sleeves! 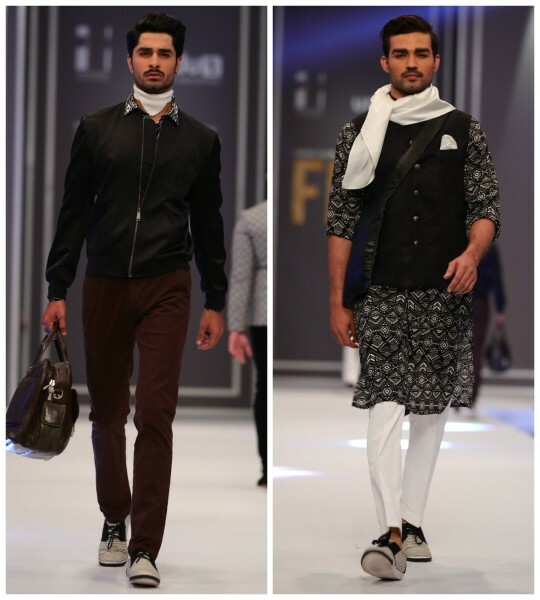 The ensembles were sophisticated yet quirky with an attention to detail and surface textures. 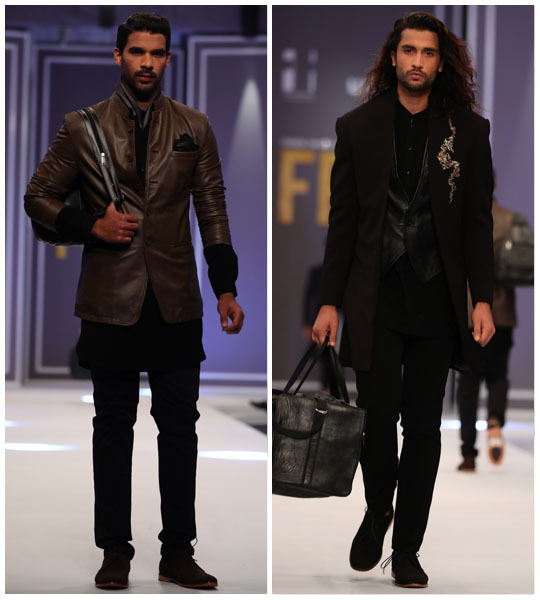 We absolutely loved the addition of the cylinder hand bags with Hasan Shehryar’s face printed on it- a real tribute to Karl Lagerfeld. 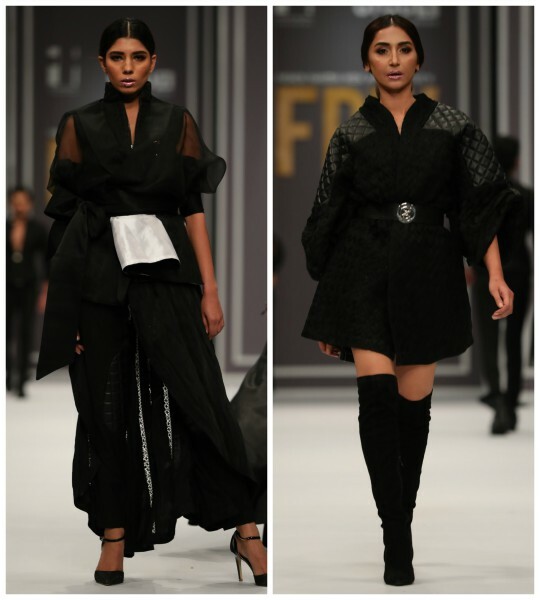 Bold, feisty and powerful, this collection made for an uber impactful fashion statement. 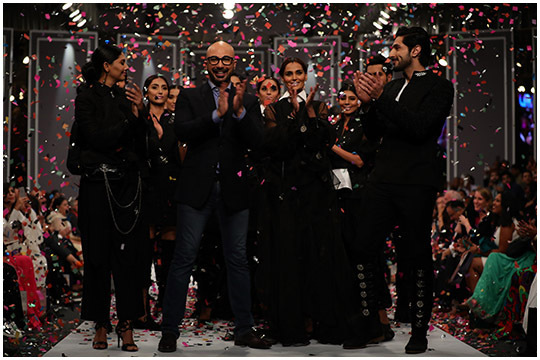 Hats off to HSY! 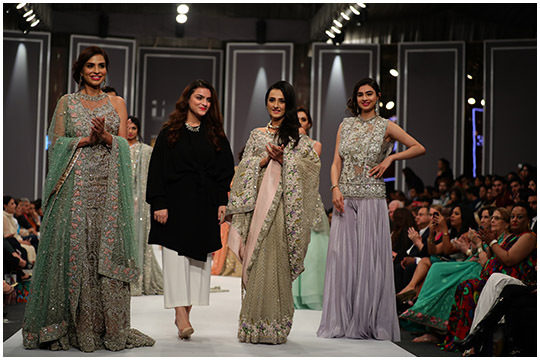 Classy, elegant and chic- Maheen Karim rocked the ramp with a stunning range of occasion wear including evening gowns and a mix of silhouettes. 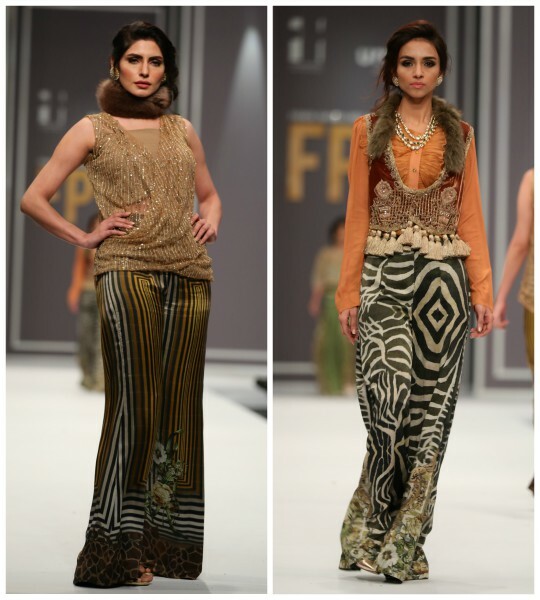 The pieces were bold and feminine all at once with stand out prints and a graceful design aesthetic. 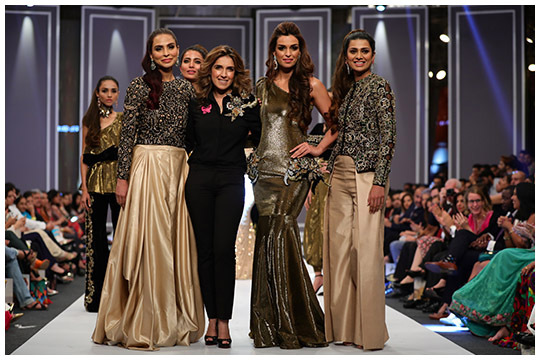 We loved how Maheen picked a unique colour scheme with shades of muted, shimmery, yellow golds and black. 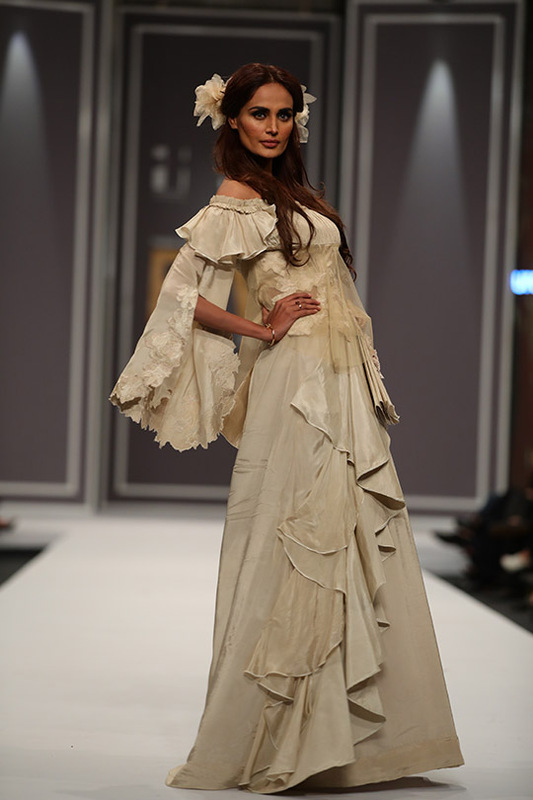 She kept it simple but impactful with minimally and cleverly placed embellishments. 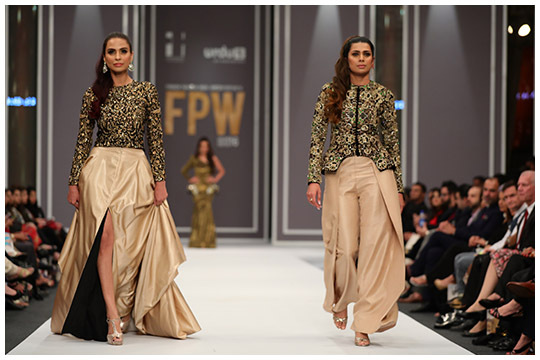 It would be hard to pick a favourite with this one, but we absolutely adored the printed matching separates- black and gold belted cold shoulder top with flared pants. 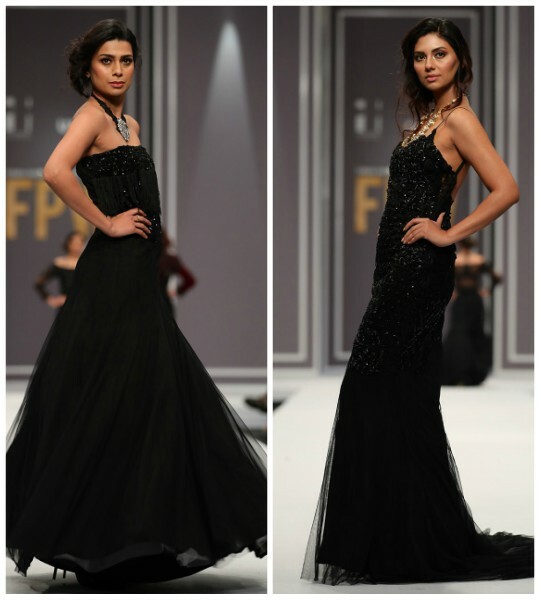 A round of applause to Maheen Karim for an ever so stylish and graceful collection! 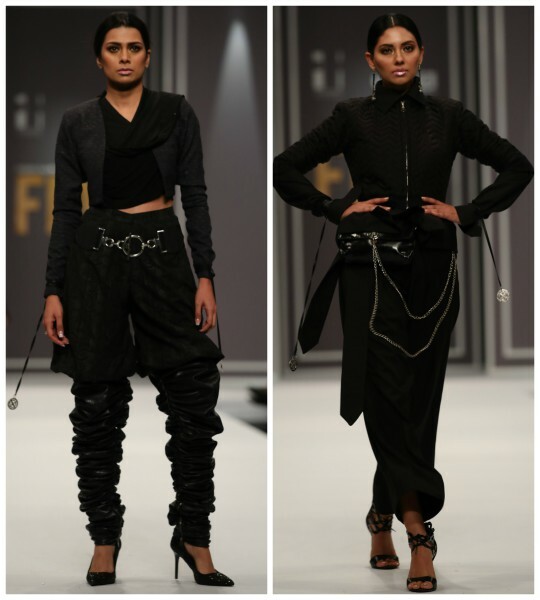 Sobia Nazir took the cake for creativity! 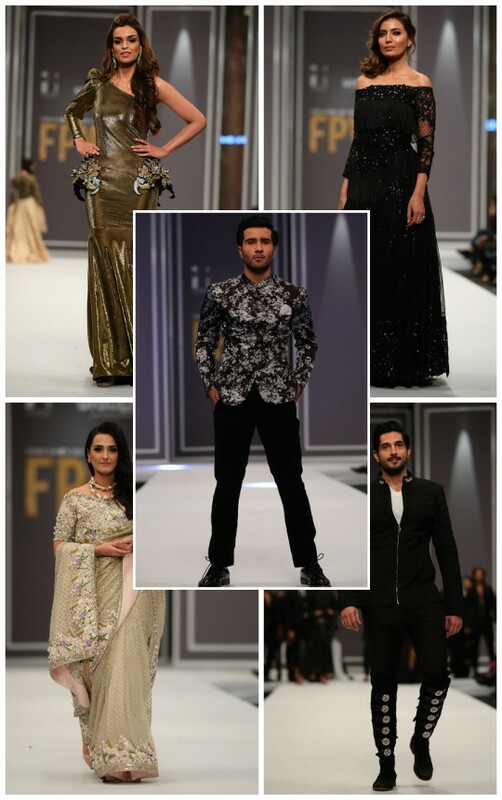 Her collection was a burst of glamour, style and innovation- best suited for the truly fashionable! 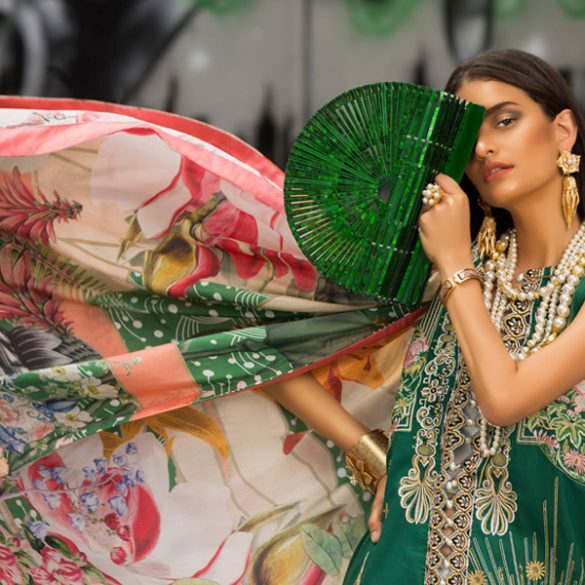 We loved how she combined tropical and baroque elements, creating fun and eye catching pieces. 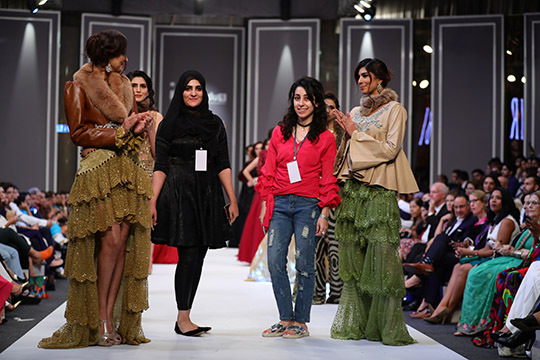 Ruffles, furs, flares, leather and prints were the stand out features in hues of green and beige with pops of black, red and gold. 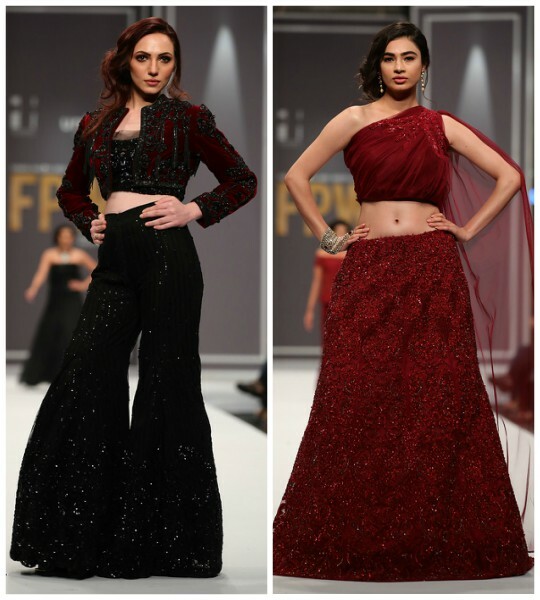 We had our eyes on the striking yet elegant all red ensembles- the perfect outfits of choice for a stand out style statement! 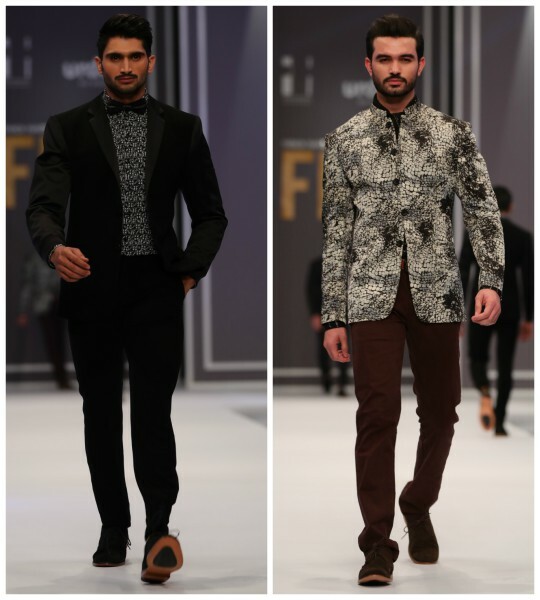 These outfits are also great if you’re looking for the perfect mix of festive, elegant and voguish. A beautifully unique and modern range! 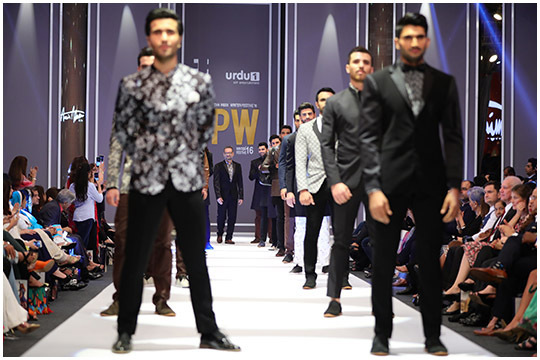 Pretty pretty pretty, is all that came to mind as we watched the models elegantly don the Suffuse ensembles on the ramp! 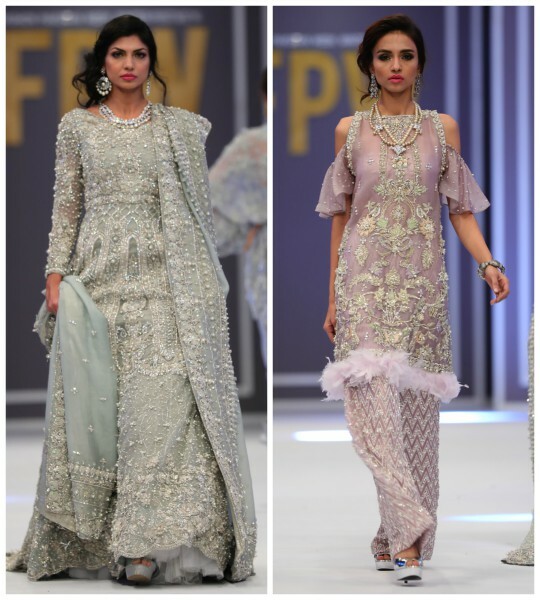 The ‘Freesia’ collection comprised of lush shades of pastels in traditional silhouettes and trendy cuts. 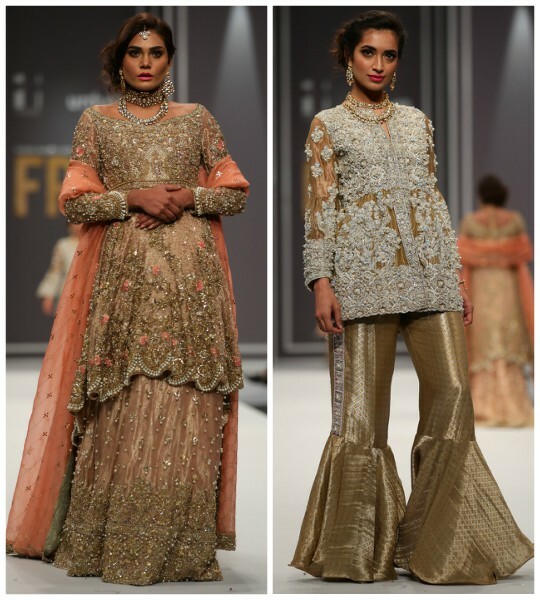 The rich pieces were heavily worked with intricate embroideries, cut work and pearl and crystal embellishments- boy did we love them all! 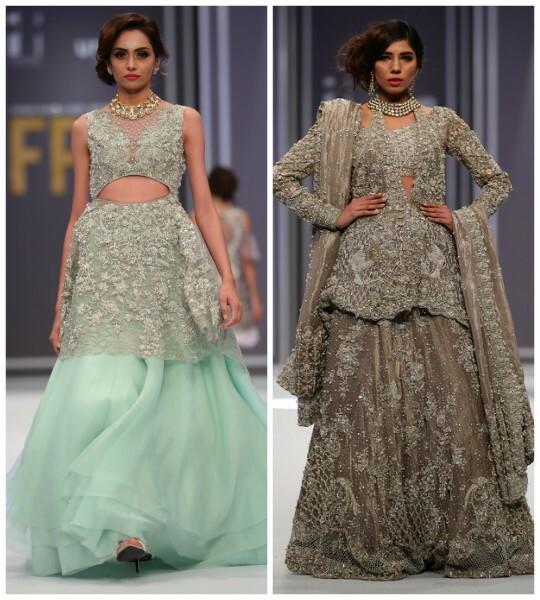 Classy, feminine and oh so elegant-ladies, these sumptous ensembles were drool worthy and are a total must have. 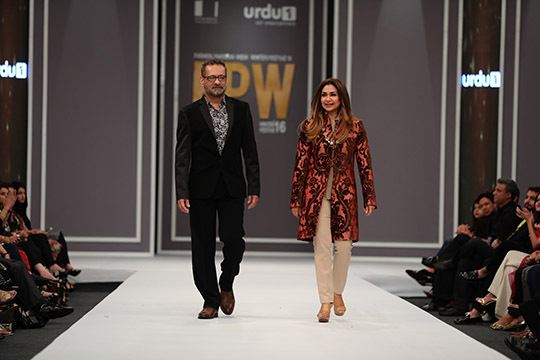 Well done Sana Yasir for always managing to impress us! Kosem Sultan- an upcoming blockbuster soap we cant wait to watch! 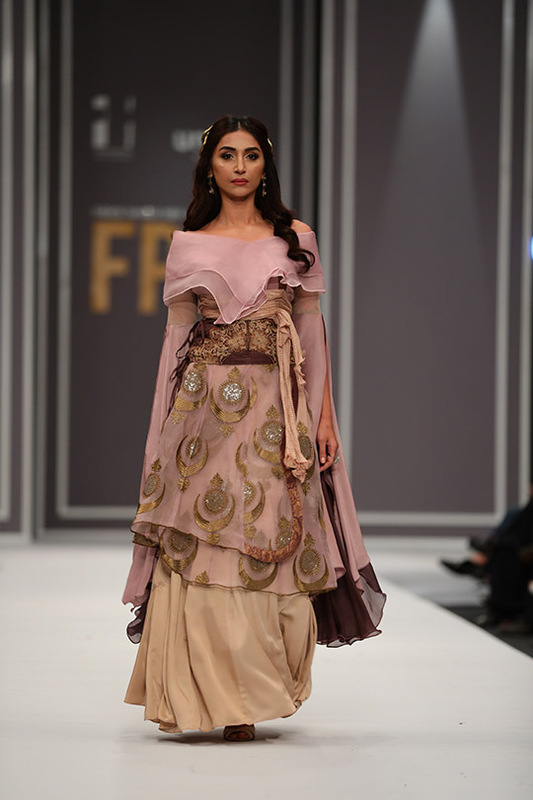 We loved Shamaeel Ansari and Amir Adnan’s collaboration on this one, two very competent and talented designers. 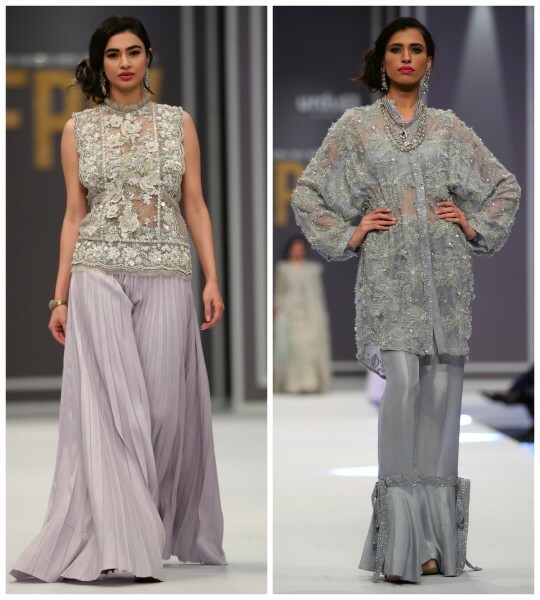 The outfits were absolutely creative with a mix of elements like ruffles, flares, jackets and layering. 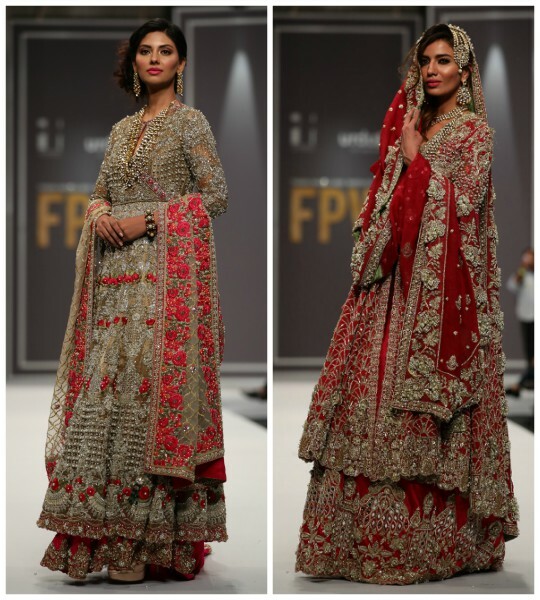 We couldnt help but crush on the regal pieces in rich red velvets and stunning gold embroideries- especially the one seen on model Nadia Husain. 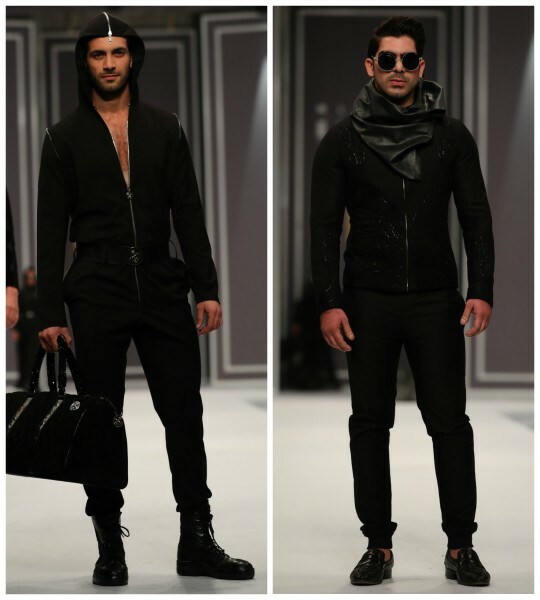 And ofcourse the boys looked super handsome in those bespoke all black outfits. A collab we thoroughly enjoyed! Ready, Set, Shoot! 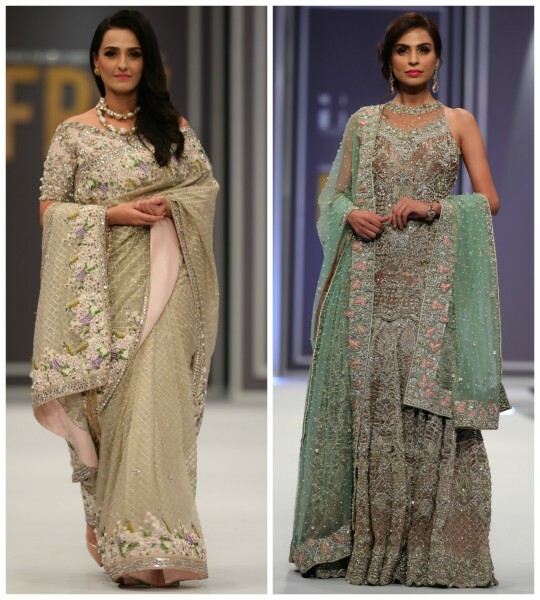 Ayesha Somaya's Ultra Trendy Fall/Winter Collection!